Posted: Thu May 03, 2018 8:41 am	Post subject: Re: Translation help Please? Could someone please be so kind as to assist me with this translation of Marriage record for Andream kostecki? sorry for the double pic. iI don't know how to delete. As a general rule of thumb, records of Catholics from the 18th Century and earlier were almost always in Latin. 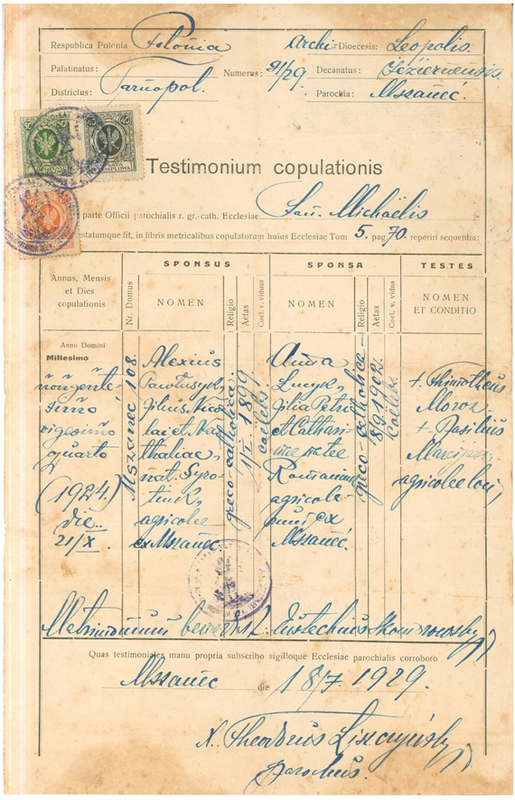 There was no civil registration system and Church baptismal and marriage records were accepted as proof of age and marital status, etc. Since Latin was the official language of the R.C. Church the records were kept in that language. Given names appear in the records in their Latin version and surnames in the vernacular. No one used the Latin version of a given name. In the translation of the record given names are translated into Polish since that was obviously the vernacular of the individuals involved. Most of the info in the entry is record housekeeping which lists the various legal requirements that were fulfilled before and during the wedding rite. Hope you find the following translation useful. Body of Entry: On the 24th day of November in the year 1785, I, the same who (is named) above, after the three banns had been proclaimed on three consecutive Sundays in the presence of the people gathered for the Divine Rites (i.e. Sunday Mass), and since no canonical impediment had been discovered, questioned the industrious* Andrzej Kostecki and Katarzyna Kołodziejonka** and after having heard their mutual consent, joined (them) by words in the present marriage rite from the Ritual of the Holy Roman (Catholic) Church (and) blessed them in the presence of the witnesses Wojciech Bardziński, a brewer, and also Jan Ukior from the village of Zbyszewice of this parish. Notes: *laboriosos/industrious: an adjective used to designate an individual as a peasant. **The suffix -onka designated a woman as “the daughter of...”(In this case of Kołodziej). In contemporary usage her maiden name simply would be Kołodziej. I have several scans from my family documents and I'm really trying to understand our history as nobody knows exactly where we are from. If anybody could help I would appreciate very much. Here is the translation. Hope you find it useful. Col. 3b: Ejus ac parentum nomen, cognomen atque conditio; item ejus nativitatis locus et habitationis = His and his parents’ first & surname and condition/state of life/occupation; at the same time his place of birth and residence: Piotr Madura, the son of Jan and of Maryanna nee Jazwicz, a sower/planter. Col. 4b: Ejus ac parentum nomen, cognomen atque conditio; item ejus nativitatis locus et habitationis = Her and her parents’ first & surname and condition/state of life/occupation; at the same time her place of birth and residence: Zofia Zima, the daughter of Antoni and of Regina nee Ziolo. Latin Notation: I, Stani(sław) Widalski, the curate, blessed this marriage. Polish Notation: As I grant permission to my underage daughter Zofia to enter into the bonds I sign (with my mark) in the presence of the witnesses +Marcin Tazborek(? 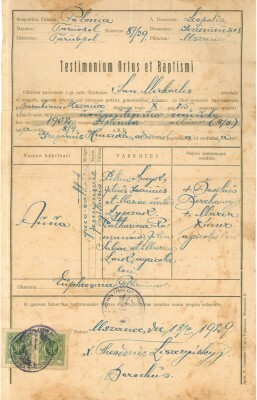 ), +Józef Krol, +(illegible given name) Madura. The area where your family lived had been part of Poland prior to the Partitions of Poland. From 1772 until after WWI the area was ruled by Austria and was part of Galicia. During the period between WWI and WWII it was part of the Republic of Poland. After WWII until the present time it is and has been part of Ukraine. Most of the research would need to be done in Ukraine. Here is a translation of the marriage certificate. Given names are translated into Polish. 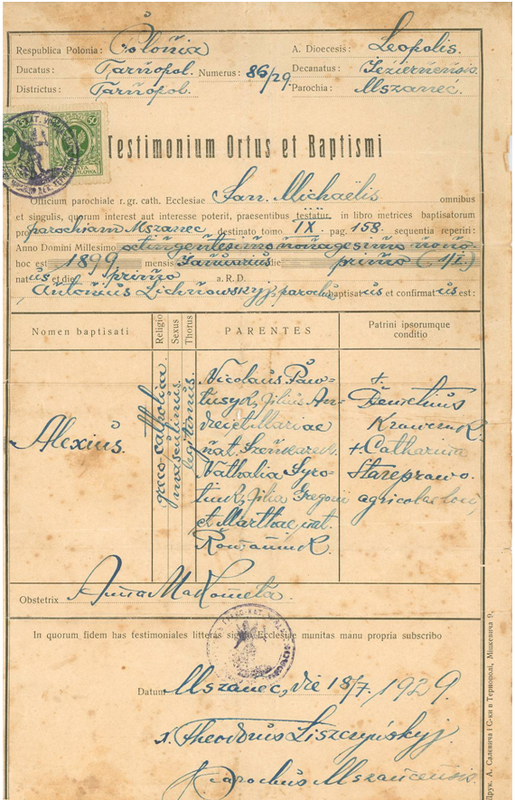 The baptismal certificates will follow as time permits. Col. I:Year, Month and Day of the Marriage: In the Year of Our Lord 1924 (both in words & in numbers) on the 21st day of October. Col. 2b: Name: Aleksy Pawłusyk, the son of Mikołaj and Natalia nee Syrotiuk(? ), farmers from Mszaniec. Eustachy Skow??? blessed this marriage. Signature: Rev. Teodor L???? ?, pastor. I'd like to know what the words immediately after Leo Borowski's name are (before "filius"). I'd also like the bottom of the record translated please. Thanks in advance--your help is greatly appreciated! The words are “miles ad tempus dimissus” which mean “a temporarily discharged soldier”. The same words begin the notation at the bottom of the record. 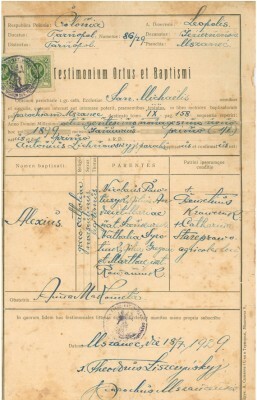 The notation at the bottom of the entry is translated: “(The groom) a temporarily discharged soldier; the underage bride with judicial consent of the court at Kopyczyn* on the 3rd day of October, 1873, Number 5100(?). Holin?? ?, the pastor, joined them in marriage. Note: * I’m not familiar with the geography of the record so Kopyczyn is just an educated guess. The Latin is Kopyczynensis. The usual method to convert the adjectival place name is to drop the -ensis. Sometimes the actual place name contains a vowel which should be restored. Since you are familiar with the geography you should be able to determine the place name with more accuracy than I can. Usually the court would be located in town relatively near the village where the parish was located. In my opinion, “a temporarily discharged soldier” usually means that he completed his active duty and was discharged to the reserves. It was unusual for a soldier on active duty to have permission from his military superiors to marry. The instantia judicalis/judicial court consent for the underage bride was usually granted by what was known as “instantia pupillaris” and was the court which delt with orphans and minors and thus was probably the court which granted permission for the bride to marry. Fascinating, thanks again for this. The village is no doubt Kopyczyńce based on my family research. Truly, greatly appreciated, Dave! Here is a copy of the translation you requested together with a copy of the certificate. The village of Kleszczowna was part of the Polish-Lithuanian Commonwealth (Rzeczpostpolita Obojga Naradów) prior to the Partitions of Poland. From 1772 until after WWI the area was within Galicia, a part of the Austrian Empire. From WWI until WWII it was part of the Republic of Poland. It is now part of Ukraine. Since I do not read Ukrainian I was not able to verify all the geographical locations named in the certificate. Notation in Cols. 2-8: Włodmierz (Vladimir) Biniewicz, the administrator of the place (i.e. the parish) baptized and confirmed (him). Which Certificate I sign with my own had and affirm with the seal of the parish church. Kleszczowna, on the 7th day of June in the Year of Our Lord 1928. 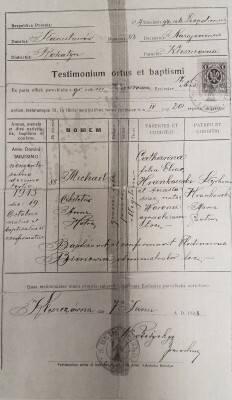 The final line names the printer who provided the certificates of birth and baptism. Could someone please assist me with these translations. There is a Birth, Marriage, and a Death. I hope someone can translate this death record. I seems like Anna Jagellowicz died at age 60. It looks like she died after (post) Michael Tkaczow. The confusing part to me is it seems like "Filia" (daughter) and "Vidua" (Widow) are both used. Also, there seems to be the word "dere" used after the Tkaczow surname. What does all of this mean??? The confusion comes when the words are continued on the next line without any indication that the letters are connected. Anna was the widow (Vidua) that Michael had "left behind" (derelicta). "Dere" is not at the end of the name but is the start of a new word which is continued on the next line - derelicta. Anna was 60 years old. Tricky. Hope this helps. I have translation books from the Polish Genealogy Society of America (PGSA) for Polish, Russian and Latin and these books are a big help! Not only do they have actual record translations but also vocabulary, names, occupations, causes of death, etc. I think they also have a new one for German. 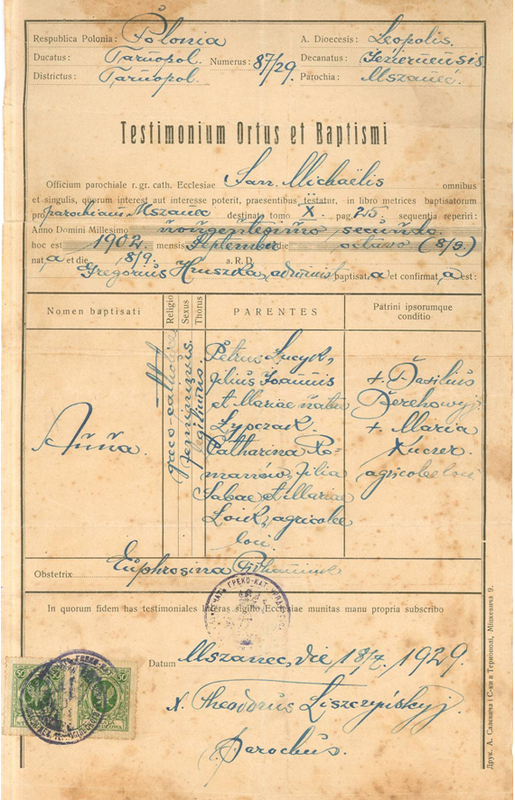 My grandmother's attached birth certificate indicates that she was born illegitimately and as it were at that time there was no reference to the name of the birth father. 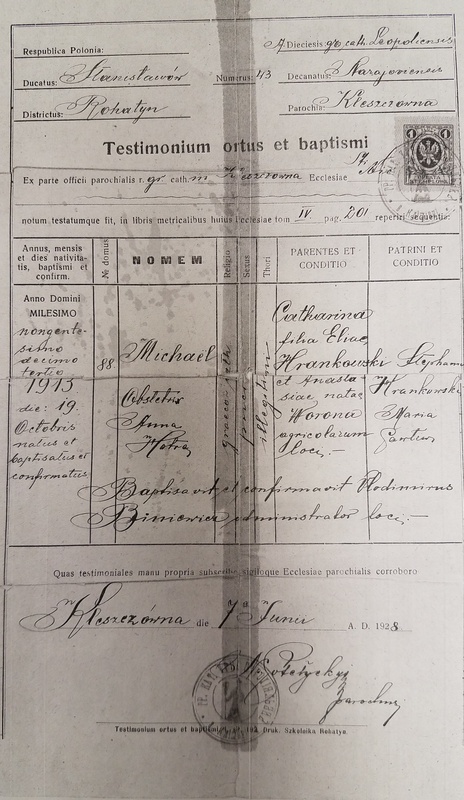 This birth certificate was requested from the parish the year prior to her emigration to the US. She came to the US alone, the ship manifest and other documents from this time period forward indicate that she presented herself as Maria or Mary Rolla and she was single, never married. 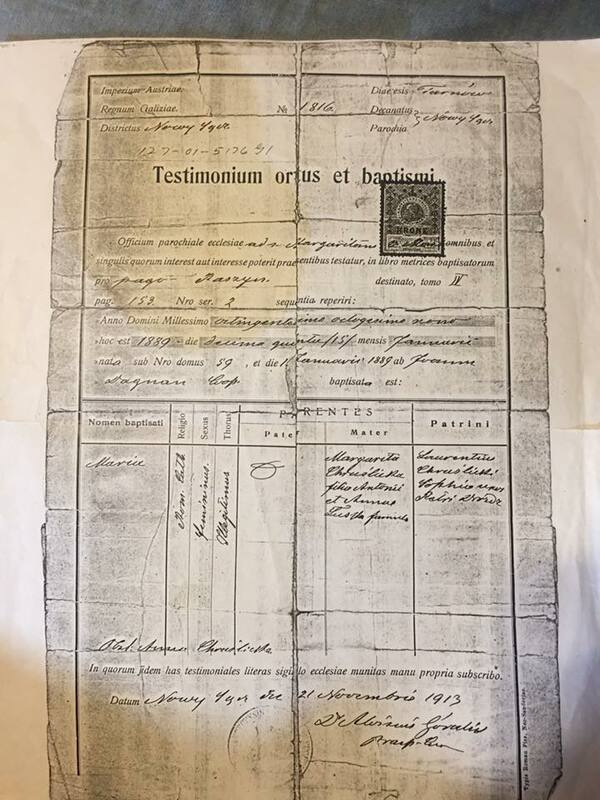 I'm interested in further translating this document and I'm wondering if church birth records were ever corrected or noted should the original birth father later marry the mother? If my grandmother's mother was originally single at the time of this birth, and then later married someone else, not the birth father, was adoption and adoption of the surname of the birth mothers new husband's name common? If it was, how would this have been conducted, through civil or through church means? Or, was it common for an adult child to take the name of one's step-father without official recording of the circumstance? 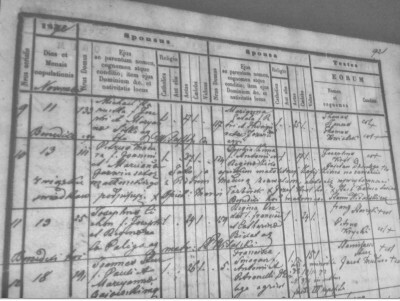 Knowing the names of the parish and the villages and the surnames of the main people in the record greatly facilitates the translation of records. Since you requested translations of three records I’ll be happy to translate the records if you are able to post that infromation. The word filia does not appear in the record. What you see as filia is actually part of the word in the previous line, dere. Just as with her surname, the word is hyphenated. The indication of the hyphen is the mark at the bottom of dere which looks like a quatation mark. The same mark is found in Anna’s maiden name. The text actually reads ‘derelicta’. Anyway, here is the translation. I hope that it clarifies the record for you. Col. 1: She died on the 23rd and was buried on the 25th. Col. 3: Demnia (I presume it was the village where she died. Without context I’m not certain.) Anna Jagełłowicz, a widow surviving after (the late) Michał Tkachow. Notation: Wincenty Sawi?? ?, the curate, burried (her).